After the first year in the field, it is absolutely essential to prune your new filbert tree. The objective is to establish the scaffold framework that will determine the permanent shape of the tree for years to come. Even though it hurts, you need to be cutting off a large percentage of the growth from the first year. I like to wait until the leaves have dropped. The tree is now dormant and you can see the structure better to prune. Pruning can be done anytime now until budbreak. REMEMBER the more you prune, the more the tree will grow. It allows the tree to concentrate it’s growth on fewer growth points. So……. As you approach your filbert tree, look at how it has grown the previous year. If there has been a lot of deer damage or bird breakage, you will need to clean it up as best you can, leaving about 3 or 4 nicely spaced shoots to grow out. Next year you can do more shaping to establish your permanent scaffolds. For a healthy growing tree, you are looking for 3 to 5 (4 is good) limbs to leave for the scaffold. Start at the top. Choose a healthy branch that is growing upward to save as your leader. Cut it in half. Cut off any branch that originate at the same point as the leader. You will get stronger branches if you have horizonal growth rather than upright. Choose 2 or 3 branches that are separated by a couple inches and balanced around the trunk for your other limbs. Try to keep these high on the tree. Cut off eveything else close to the trunk. Cut your saved branches in half. Clean up any suckers (especially under your plant protector) and you are finished. I also like to choose where I cut the saved limbs off. I choose a bud pointing the direction I want the limb to grow – out of the aisle, to the direction different than the top – whatever balances the growth of what you are leaving. It only takes a minute to prune your tree. 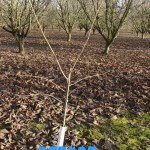 These are before and after photos of how your first year pruning should look. Good luck! Here is a healthy filbert tree with the first year growth. 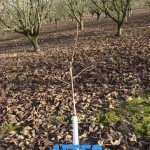 This entry was posted in Hazelnuts, How To, New Tree Care, Orchard Care and tagged Orchard Care, Pruning. Bookmark the permalink.